Orbit of Comet 67P/Churyumov-Gerasimenko in the distant past. The comet that Europe's Rosetta spacecraft orbited for more than two years was probably born in the realm of icy bodies beyond Neptune, a new study suggests. New analyses of the orbit of Comet 67P/Churyumov-Gerasimenko — on which Rosetta intentionally crash-landed on Sept. 30, ending the probe's historic mission — trace the object's origins back to the Kuiper Belt, whose most famous denizen is Pluto. 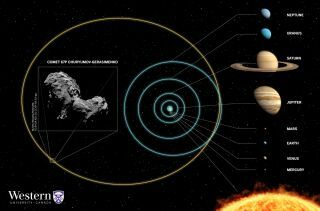 "These results come from computations of the comet's orbit from the present to the past, which is computationally difficult due to the chaosity of the orbit caused by close encounters with Jupiter," Mattia Galiazzo, a postdoctoral fellow in the Department of Physics and Astronomy at Western University in Ontario, Canada, said in a statement. "Thus, the details are obscure, but we can establish a dynamical pathway from its current orbit back to the Kuiper Belt," added Galiazzo, who presented the findings Monday (Oct. 17) at the joint 48th annual meeting of the Division for Planetary Sciences (DPS) of the American Astronomical Society (AAS) and 11th annual European Planetary Science Congress (EPSC) in Pasadena, California. Galiazzo and co-author Paul Wiegert, also of Western University, said they think the 2.5-mile-wide (4 kilometers) 67P, which takes about 6.5 years to orbit the sun, has been in the inner solar system just 10,000 years or so. Rosetta launched in March 2004, then took a long and looping route through the solar system before arriving at 67P in August 2014, becoming the first probe ever to orbit a comet. That November, Rosetta achieved another first, when the orbiting mothership dropped a washing-machine-sized lander onto the comet's surface.